(Cambridge, MA) The ancient civilizations of the Middle East where a progressive and highly advance set of empires and people, making large strides in the studies of mathematics, astronomy, and architecture. Many of these contributions have had a phenomenal affect on the modern world, including their ancient stories that have influenced the structure and tone of a wide range of stories throughout Western civilizations, from King Arthur and the Nights of the Round Table to Loony Tunes. Many of the more influential stories from the area were collected within the famous book 1001 Arabian Nights, a series of tales and legends of ancient Persia, ranging from epic adventure tales to short comedies told around the central focus of a young woman named Scheherazade attempting to quell the rage of a wronged king and save the woman of his kingdom. A selection of these tales, as well as the story of Scheherazade and the king is the focus of The Nora Theatre Company and Underground Railway Theater’s first combined effort Arabian Nights; a grandly staged yet minimal production of classic tales of adventure, morality, and humor.The play opens in ancient Persia, where King Shahryār (Vincent E. Siders) and his wife (Debra Wise) live in happiness and rule over the kingdom with wisdom and kindness. This all changes when the king discovers his wife is having an affair with another man and puts her to death. He quickly falls into a great despair and declares that he will never give another woman a chance to cheat on him, taking wives for one night and then putting her to death the day after. This horrid reign of death plagues the land and threatens to cause an uprising among the people in the name of their murdered daughters. It is then that the royal advisor’s daughter Scheherazade (Evelyn Howe) puts a plan into action to heal the king of his bitter life and save the kingdom from civil war. She asks her father to marry her to the king and then, with the help of her younger sister Dunyazad (Paige Clark), begins to tell the king a series of intriguing stories, holding his attention so tightly that he keeps her alive night after night in order to hear the next story. As her stories go on, they begin to show a trend of honor, mercy, and love, which she attempts to impart on Shahryār. The production of Arabian Nights is preformed in a very Cirque Du Soleil fashion, with actors in highly colorful costumes representing landmarks, mythical beings, and animals instead of set pieces and props. The most extravagant and impressive example of this is the story of “Sinbad The Sailor”, in which the entire tale is told through puppetry, using small ventriloquist like dolls to represent humans and large-scale models to show mythical creatures such as the legendary giant bird The Roc. 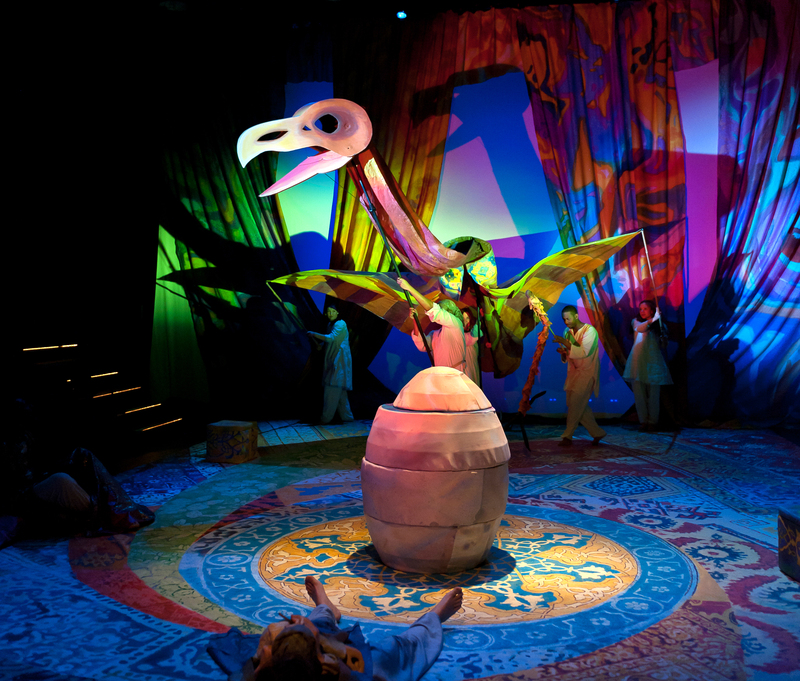 Everything in the play is very vivid in its color and movement, keeping the attention of younger children while celebrating the color pallet of ancient Persian art. A cast of nine actors play multiple roles in order to fill out the many different characters that that tales contain. Siders is the only constant presence on the stage, keeping the story grounded in its original setting. The dialogue of the play is read as it is within a fairytale, with actors explaining what they are doing as they do it in order to maintain the direct narrative feel of the production. The actors also perform acrobatics, belly dancing, and other physical spectacles in order to add to the celebratory nature of the show. Arabian Nights only true problem is that, because these stories are a result of a word of mouth tradition, they can become extremely repetitive at times due to how simple they had to be for people to remember them throughout the centuries. Though this can cause some of the longer stories to drag, the production still stands as a well designed testament to the timelessness of the stories. It is fun, family friendly, and full of fantastic visuals to make it one of the more likeable productions that has been seen at The Central Square Theater in recent memory. This entry was posted in Comedy, Drama and tagged "Sinbad The Sailor", 2011, ancient Persian art, Arabian Nights, Cambridge, Central Square Theater, December, Dunyazad, Evelyn Howe, family, folk tales, King Shahryār, legends, MA, Nora Theatre Company, November, Paige Clark, puppets, Schehrazade, Storytelling, Underground Railway Theater, Vincent E. Siders by anthonygeehan. Bookmark the permalink.